Any Mom will tell you that when she was pregnant, many of the gifts she got were for her baby – even if the occasion wasn’t necessarily for the little munchkin in her bump. While it’s normal for people to feel excited for a baby on the way, it’s no reason to completely forget about the expecting Mom during her pregnancy. If you’re wondering what you can give to a Mom-to-be to help her go through her pregnancy, take cues from this list of affordable gift ideas. Stretch Mark Cream – Yes, it might seem a little strange, but the pregnant Mama will thank you for this gift for many years to come. There is always a risk of developing stretch marks during pregnancy, since the body expands at a much faster rate than the skin can cope with. The result is the development of hundreds of little, crooked lines that can take up the entire abdomen. In some cases, they also develop over the thighs, the back side, and even around the breasts. Purchase a stretch mark cream for an expecting Mom so she can have the same flawless skin after birth, as she did before she got pregnant. Maternity Footwear – Forget the maternity gown and stretchy pants – she’s probably already got a ton of those! What many women don’t expect during pregnancy is the engorging of feet. Because of the changes in their physiology, and the obstruction of veins in their abdomen due to its expansion, it’s likely that women experience edema in their feet. This basically means that water builds up inside their feet, as there’s an inefficient blood circulation. It’s nothing to be worried about – edema in pregnancy goes away after birth. However walking around with swollen feet is never comfortable. Make sure she won’t feel all too awkward when she roams around her favorite mall by giving her a pair of comfortable maternity footwear that doesn’t sacrifice her fashion sense. Total Body Pillow – If you’ve ever tried sleeping while pregnant, or if you’ve ever slept beside your pregnant partner, then you already know why the special expecting Mom needs a total body pillow. Sleep is one of the most challenging activities for pregnant ladies because of the changes in their anatomy. What’s more, that nasty edema makes it a lot more difficult to find the right position since swollen body parts need to be elevated. 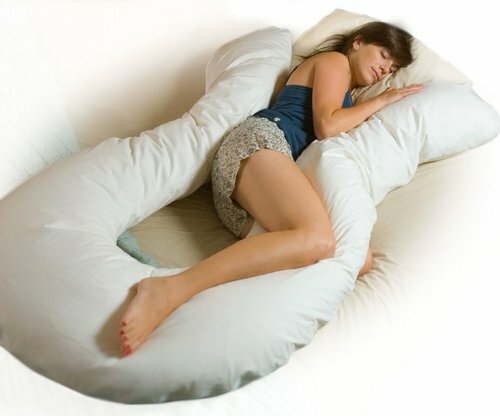 To help mommy get a good night’s sleep before her little baby arrives, gift her a total body pillow. Thanks to you, her night time may get a little less complicated and a whole lot more comfortable. You can also purchase a few positioning pillows that will support her back and hips while she’s seated to reduce the stress on her body. Moms never seem to get enough credit for the struggle they face during pregnancy. So be that one person who makes sure to appreciate her for all that she’s soldiering through. Give the special expecting Mom in your life a gift to make her pregnancy a little more pleasant and a whole lot more memorable by taking note of these perfect gift ideas.